While the flashy performances and biggest categories won’t start for another two hours, the 60th Annual Grammy Awards has already begun in New York City, and one prestigious winner happens to be Carrie Fisher, who dunked on Neil deGrasse Tyson, Bernie Sanders and Mark Ruffalo, Bruce Springsteen, and Shelly Peiken in the Best Spoken Word Album category. As predicted, she is still shining from beyond. This is her first Grammy. 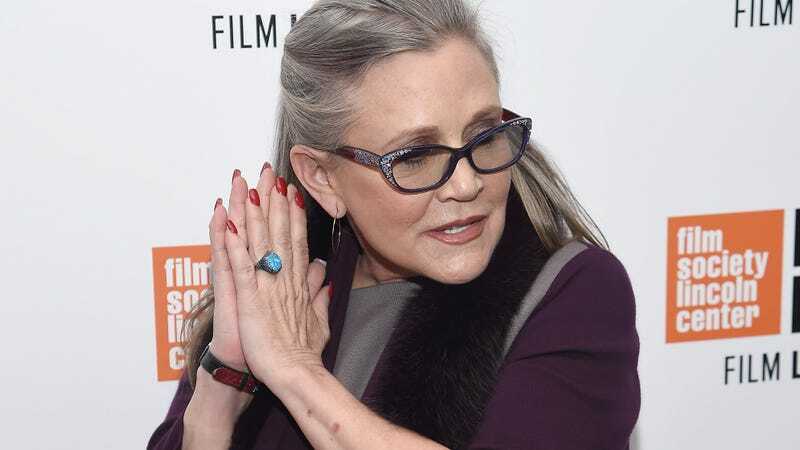 Fisher won for the audiobook The Princess Diarist, which is a typically hilarious, heartwarming memoir about her days filming Star Wars at 19, including her fawning teen affair with Harrison Ford as well as flowery diary entries and poetry about her confusion at the time. Like all of her books, it is wonderful, and while I haven’t heard the audio, anyone who’s seen Wishful Drinking or just listened to her utter words at any point will have no doubt she deserved it.